Great Gershwin musical, "Crazy for You," is coming to the Lakewood Cultural Center. Pete Roybal and Mike Bieda, City Council members for Ward 3, will meet with residents at 9 a.m. Saturday, March 23, at Phillips United Methodist Church, 1450 S. Pierce St. Subscribe to Ward 3 Meeting Reminders. Monday, March 18: 4 p.m. workshop for the continuation of the City Council’s Annual Planning Session followed by a 7 p.m. Study Session for presentations on the 40 West ArtLine Project and the annual report from the Lakewood Advisory Commission. Change in upcoming agenda: To allow more time for community discussion, the City Council has rescheduled the study session about short-term rentals to May 6. March 18 is the deadline to submit a nomination for Lakewood’s annual Sustainability Awards. Neighbors, youth, local businesses, student groups and community organizations are eligible. To submit a nomination online, visit Lakewood.org/SustainabilityAwards. 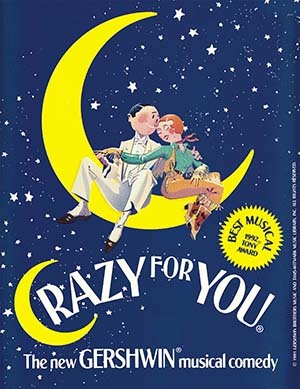 If you love Gershwin tunes such as “I Got Rhythm” and “Someone to Watch Over Me,” then get your tickets for the musical “Crazy for You.” The Lakewood Cultural Center and Performance Now Theatre Company co-present "Crazy for You" through April 7 at the Lakewood Cultural Center. This delightful homage to the beloved, optimistic musicals of the 1930s has a love story, great songs and spectacular tap dance routines. Tickets are available at 303-987-7845, the Box Office and Lakewood.org/LCCPresents. Let experienced city tax auditors answer your business’ city tax questions at an upcoming workshop, which will be 8:30-10 a.m. on April 10 at the Civic Center, 480 S. Allison Parkway. It will cover both sales and use tax. Register at Lakewood.org/TaxSeminar. The city’s government-access channel airs City Council meetings and has a variety of videos to keep you informed. Watching these programs is even easier now with Cablecast Screenweave. By downloading this app on an Apple TV or Roku device and searching for Lakewood8, you can watch the city’s videos and live streams. Watch a brief video to learn more. 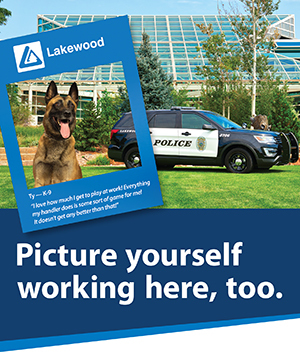 If you can picture yourself in a positive work culture that’s geared to helping you build a career, then consider applying to become a Lakewood Police agent. Visit CareersMadeInLakewood.org. City Council members host Ward Meetings every month to connect with residents across the community. These meetings are a great opportunity to share your ideas and concerns as well as to learn more about your community from elected officials. Find out when each ward meets monthly at Lakewood.org/CityCouncilWardMeetings. Watch as Lakewood High School raises money for the Foothills Animal Shelter while learning about the important work of the Lakewood Police Department’s K-9 unit. The Lakewood’s 50th Anniversary mayors’ panel has been rescheduled to March 21. The Lakewood Branch of the American Association of University Women has invited all five living mayors to share highlights of their tenure and to provide insights and predictions about the city’s future. Mayor Adam Paul and former mayors Linda Shaw, Linda Morton, Steve Burkholder and Bob Murphy will be part of the event. It will start at 6:30 p.m. with cake to celebrate followed by the 7 p.m. presentation at Holy Shepherd Lutheran Church, 920 Kipling St. For more information, please contact Mary Wylie at 303-989-0241 or dnmwylie@gmail.com. Read about the latest updates to Downing Reservoir and other information about the Federal Center in the latest e-newsletter about this facility in Lakewood. Help the Severe Weather Shelter Network serving those who are homeless in Jefferson County by eating at Chipotle on March 17 at 7355 W. Colfax Ave., Suite 103. The restaurant will donate 33 percent of its proceeds from diners who eat between 4 and 8 p.m. on that day, so let the cashier know you are ordering to support the network.